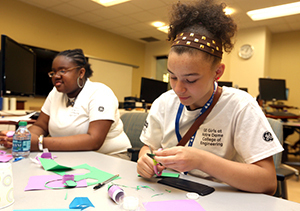 Local sixth through ninth grade girls will spend a week on the University of Notre Dame campus beginning Monday (July 11) programming LEGO robots, creating a smart phone app, making their own lip balm and designing and testing Alka Seltzer rockets, and other activities as part of the third annual GE Girls@Notre Dame summer camp. The day camp, which takes place on 12 college campuses throughout the country, is designed to introduce middle school girls to STEM activities, with the goal of encouraging them to pursue careers in science and technology. The event, which runs through July 15 (Friday), is sponsored by GE Global Research and GE Healthcare and put on in conjunction with the University of Notre Dame and the Women’s Network of Chicago. Forty-six girls from South Bend’s Brown, Navarre, Jefferson and Jackson schools are expected to participate in the camp. Workshops are led by GE personnel and Notre Dame faculty and offered under each day’s “theme,” including construction/civil engineering, programming, electrical & physics; aerospace/aviation; and chemistry. This year, the participants also will have the opportunity to tour Notre Dame’s new $36 million turbomachinery research and testing laboratory at Ignition Park in South Bend and meet with laboratory staff. This year’s camp will also feature an Alumni Day during which 16 girls who attended the camp in its first two years will return and participate in activities. Originally published by William G. Gilroy at news.nd.edu on July 07, 2016.